It also comes with the Mediatek VCOM Driver, Mediatek CDC Driver, Samsung USB Driver, Spreadtrum Driver, Coolpad Driver, ADB Driver Installer, Hisilicon Driver, Inf Temp Cleaner, Devices Uninstaller. To install the driver, launch the Application on your Windows Computer an dclick on the Driver Button to begin the installation process. Installation process will hardly take 2-3 minutes to be completed. 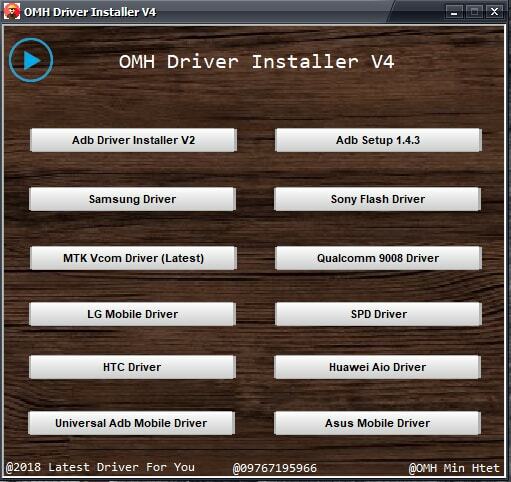 Credits: OMH AIO Driver Installer V4 is created and distributed by OMH Min Htet (developer). So, full credits goes to OMH Min Htet (developer) for sharing the tool for free.